Comet 209768A | ROTARY/MaxTorque 04-457 | Chain drive clutch for Go Karts/Snowmobiles/Boonie Bikes | Replaces Comet Industries clutch 209768-A, STENS 255-133, SKI-DOO 415129554, 417217200 Drive Pulley Assembly | 165-046 Baja OEM 10T, 3/4" Bore. Home > Comet Clutches and Parts > Comet 209760A OEM replacement chain drive clutch. > Comet 209768A OEM Replacement Chain Drive clutch. Comet 209768A Chain Drive Replacement clutch. OEM For 400 Series Comet Go Karts. 3/4" Bore. 10 Teeth. Genuine Comet 209768A Replacement Single Sprocket Clutch for Comet "CSC" 400 series clutches. Replaces COMET CLUTCH 209768, STENS 255-133, ROTARY/MaxTorque 04-457. 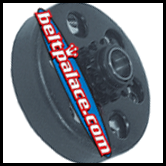 Replaces the '98-'06 Ski-Doo Mini-Z youth snowmobile 415129554, 417217200 Drive Pulley Assembly (POULIE MOTRICE). More contact surface than most competitor's chain drive replacement clutches. Made for up to 5HP 4-cycle engines. Approx. engagement of up to 2,200 RPM. Genuine Comet Industries part! Made in USA. Comet 209768-A Specs: Bore: 3/4” (.75 inch), 4” Diameter, 10 tooth, 40/41 Chain, 2.22” deep. ROTARY 04-457 CLUTCH MAX TORQUE 3/4 INCH 41C 10T (“Six Shoe”). Comet CSC Part 209768A, Single sprocket-Self Contained. STENS 255-133 Maxtorque Sprocket Clutch (“SS”). 1998-2006 Ski-Doo Mini-Z youth snowmobile 415129554, 417217200 Drive Pulley Assembly (POULIE MOTRICE 415129554). Steel construction. Made in USA! Genuine Comet Industries part Made in USA. If you find it cheaper, there's a reason! Comet Industries 209748A Chain Clutch. 5/8" Bore, 11 Tooth Sprocket. 5HP 4-cycle rated. 2200 Approx. Engagement RPM. CSC 400 Series. 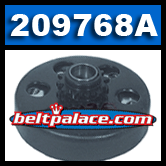 209769A is the drum and sprocket replacement for Comet 209768A Chain Drive Clutch. This is just the drum cover and sprocket, no other "internal" clutch parts come with this item. Suitable replacement for 40 Series CSC, 10T, 40P Chain drive clutches. Comet 209760A OEM replacement chain drive clutch. Comet 209760-A Chain Drive clutch for Go Karts. (Stens replacement clutch# 255-125) Replaces Comet CSC 400 series clutches. Replaces Chain Drive COMET 209760. Also replaces Manco 4335. More contact surface than most competitor's Go Kart replacement clutches. Made for up to 5 hp 4-cycle engines. Approx. engagement of up to 2,200 RPM.